Coming up with an easy healthy dinner recipe when you’re feeling under the weather is definitely a challenge, believe me, I know! I planned to get the flu vaccine this year because I had a nasty flu last year that knocked me out. But guess what happened? I got the flu a few days before my vaccine. My entire family got it! It started with little princess, then went to husband, then it landed in my body. It is not fun being sick, especially when you are a mother and a household chief. Everything goes upside down. Kids and husband help but still. While I tried to rest as much as I can, I had to feed myself and the crowd. The dinners had to be easy and quick. Like really quick. Less than 30 minutes. 15 minutes were my maximum time I could stand in the kitchen. Luckily, Patak’s came to the rescue. They have an array of cooking sauces that will help you whip an easy healthy dinner recipe with ingredients you have in hand. So I made the following easy healthy dinner recipe. Of course kids asked for more and of course I did not make enough because I was too tired to make the right amount in the first place, so I had to make it another time. 2 cups of your favourite noodles cooked. Add garlic and diced pumpkin. Cook until tender. Add the sauce and let it cook for extra minutes. Serve with your favorite noodles. That’s it! So easy, you can even make it when all you want to do is curl up under a blanket and sleep! 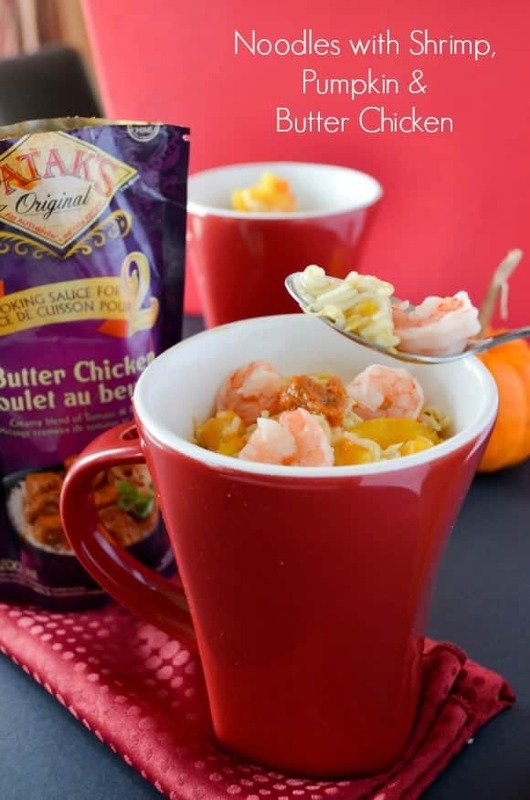 Did you know that Patak’s recently released delicious new Cooking Sauces for 2? They’re a fast and easy way to Mix in a Little India. Grab items from your fridge and pantry, then use Patak’s Cooking Sauces for 2 to turn them into a memorable meal! They come in several amazing varieties, including: Tandoori, Tikka Masala, Butter Chicken, and Spicy Cumin and Ginger. Let me tell you something, when you’re feeling miserable with cold or flu symptoms, the spicy warm goodness of Patak’s sauces really help make you feel better. Looking for more delicious recipes to spice things up in the kitchen? Visit Patak’s wonderful Good Korma blog! Serve Dessert in Minutes with a Fun Strawberry Kiwi Pound Cake Kebabs Recipe! 20 Brilliant Ways to Build Self-Confidence and Be Happy! What a great new recipe. I would love to make this but I’d have to take out the shrimp since my allergic. But I love pumpkin so it works. Wow I have never heard of this before but it looks delicious! Perfect for a cold day. Yum! This looks so good and easy…easy is my favorite! Oh that looks delicious! 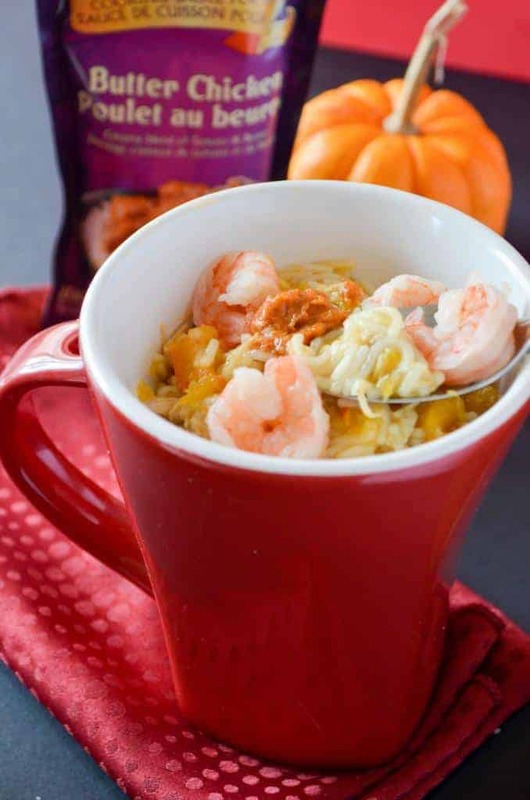 So easy to do, and it was a great idea to add pumpkin in there. Love it! This recipe sounds yummy, I definitely need to try it! That sounds really different and tasty. I love the idea of using a cooking sauce! Very interesting with the pumpkin in it. Looks delicious! I love any shrimo dinner. Pumpkin is a new twist. You had me at shrimp. Now I definitely have to give this a try. That noodle shrimp dinner looks awesome. I would love to make this some time. I know the family would love it. Haha, I didn’t even read it before it was pinned. I have to look into that sauce. Sounds yummy. 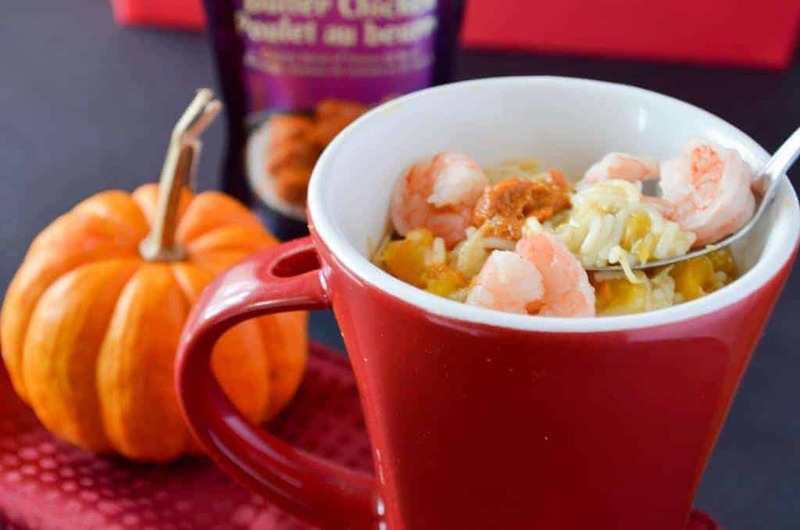 I love butter chicken and then you said the magic words- Pumpkin and Shrimp! YUMM! I’ll take two mugs to go please! 😉 I’ll have to try it out ASAP! I would have never thought to add pumpkin to this dish. Now that I think of it this way, the tastes would be wonderful. Kind of like sweet potatoes with chicken noodle soup. Great combinations. I could eat noodles all day long. Your dish looks scrumptious! New product for me – I will be checking our market if they carry it. This looks delicious! I hadn’t heard of the new cooking sauces. I’ll keep my eyes open though. I would have never thought to put chicken with pumpkin. this looks delicious! that looks like it would make a great lunch on a cold day. love these types of dishes. The food looks so good in that mug. I want to grab a spoon and dig in. That definitely sounds like a unique dish! That looks amazing! Love shrimp. What a nice hearty meal! I love shrimp and this sounds delicious. I’m definitely getting a cold and could so use a bowl of this now. That sounds so good. I need to make this. Like now. Kids Will Go Crazy For This “Turkey” Doughnuts Thanksgiving Sweet Treat! Baby-Proof Cabinets Easily Without Tools with Rimiclip!